Submitted by Fred on Mon, 06/09/2014 - 5:20pm. 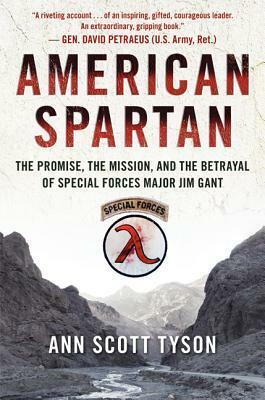 American Spartan: The Promise, the Mission, and the Betrayal of Special Forces Major Jim Gant is a MUST read for any military professional on how the United States military, including US Special Operations Command remains a bureaucratic organization hampered by a top down hierarchy filled with people more concerned with their egos, status-quo, than accomplishment of the mission, regardless of who achieves that goal. The focus of most reviews has been on Jim Gant’s unethical conduct (easily recognized as being caused by PTSD (Jim was in combat longer than most people)), while ignoring the main themes of the book. Most people have referenced Jim Gant going native and assuming the persona of rogue Special Forces COL Walter Kurtz from the movie Apocalypse Now (based on Joseph Conrad’s book Heart of Darkness (1899)). Unfortunately, based off personal experiences with the Army, I firmly believe his violations of breaking General Order #1 (and all the subsets of such which includes alcohol consumption, engaging in sexual activities with the woman who later became his wife, etc) had nothing to do with some Military brass desires in destroying his career—though these actions made it easier (how many of the brass flew into see Jim while these were going on, but as long as his actions were successful, tended not to notice them?). Instead, I am almost certain it had to do with that fact that Gant was a major, did not plow the traditional lanes prescribed by the personal system. Gant was a proven combat leader (Silver and Bronze Stars as well as well as Purple Hearts), had a great idea, then had the moral courage to write and push it in order to win in Afghanistan. His paper “One Tribe at a Time” was recognized by the highest levels of the government and the military. But, and a big but, he did this as a major and not as a selected member of the club (which is actually more significant). He was so adamant in his belief on how to deliver victory, that he broke from the prescribed career course to accomplish this task. I can speak from personal experience. Immediately after a two hour briefing to the Vice Chief of Staff of the Army, General Jack Keane, in late June 2002, the general told me to brief a long list of people, coupled with guidance from the Secretary of the Army’s staff, I spent two years from June 2002 to June 2004 briefing almost a hundred senior leaders ranging from senior generals, to Congressman, senior civilians as well as staffers and think tanks. All this, like Jim Gant was followed by a vocal order only. There was no written order or directive to my chain of command detailing these important additional duties prescribed by the highest levels of the Army. My wife and I were left to get me to the briefings on our own, with no assistance from anyone (I had one of two feet rebuilt at the time, so my wife Lorraine had to drive me all over D.C. to get to these briefings). Compare the story of Major Jim Gant with how German Captain Willy Rohr changed infantry tactics, weapons and doctrine within the World War One German Army is a remarkable story. He succeeded in his task as a result of the German Army’s ideas of operational adaptability, mission command and decentralized authority. Captain Rohr changed squad warfare and German Army tactics in two years and seven months. Capt Rohr’s unit did it all – experimented with new weapons and equipment, combat tested new ideas, evaluated new tactics, and trained those which would change an entire army. He completely revolutionized the infantry linear tactics of the preceding hundred years. The German HQ used decentralization to great effect with Captain Rohr. No rules, regulations nor superiors held Captain Rohr from developing the doctrine or training the entire German Army on the Western Front. To dig the dagger deeper, Swartz, echoing the command in Afghanistan, went on, “…instead,’ he said, ‘Jim would be assigned as a ‘staff officer to the J35 Future Operations Directorate,’ putting Jim in the last place on earth he ever wished to be: behind a desk.” Swartz went on to close out his email to Jim, “I understand that you were potentially putting together a select group of NCOs to accompany you to the headquarters. Now that you have a better understanding of the scope of your duties working within the J35, you realize you do not require a team of individuals to accompany you,’ Swartz wrote.” All this occurred in contrast to the support Jim had received from the President, Secretary of Defense, and senior military leaders such as Admiral Olson and General David Petraeus upon reading his paper. They recognized Gant had a solution to the strategic problem called Afghanistan. Jim Gant was one of the few that understood how to successful conduct Counter-Insurgency (COIN). The question would become, how much support would they throw behind this major? On June 28th 1863 on the authorization of the President of the United States, three Army captains were promoted to brigadier generals. The Army of Potomac Cavalry Corps Commander General Alfred Pleasonton implored the new army commander Major General George Meade to allow him to reorganize the mounted troopers to make the corps more effective. Meade approved Pleasonton's recommendations that three captains– Wesley Merritt, Elon J. Farnsworth, and George A. Custer– who were aggressive combat leaders, were jumped from captain to brigadier general, bypassing all the ranks in between. Merritt was given command of a brigade in the First Cavalry Division while the other two youngsters were assigned to Judson Kilpatrick as his brigade commanders. These promotions helped transform the lackluster corps into an effective and aggressive arm of the Army that eventually helped the Army win the war. The book also exposes the misuse of the Special Forces from a strategic asset to a tactical tool focused on attrition warfare. The organization is a strategic asset, experts at developing and assisting foreign forces in fighting our enemies, so US forces do not have too. Jim Gant’s push of “One Tribe at a Time” exposed the emphasis on tactical attrition in the use of “direct-action” missions (raids, assaults, the killing and capture of “high-value targets”). No one questions the bravery and unique skills of the Special Forces soldier (I have many friends in Special Forces and they are some of the finest professionals I have had the honor to know), but transferring them from a strategic to a tactical asset fulfilled the short-term career outlooks of many officers. There was more glory in kicking in doors, seizing objectives in night time raids that satisfied the short-term requirements built into officer performance evaluations than the long term requirement, taking many years, to build up indigent forces. Also the results from direct action missions brief better statistically on PowerPoint slides showing immediate, time-now progress, versus the time it takes to grow local forces easily emerges into the “show-me now” personnel system. The year-long rotation of individuals and units, a lesson not learned from Vietnam also fits into the former, and not the latter problem—people staying for less than one year, could not grow the relationships built on trust necessary for Jim’s program to succeed. Jim Gant recognized all these issues, but his highlighting them through “One Tribe at a Time” did not sit well with many middle grate and senior officers. George S. Patton was a Lieutenant when World War I began for the U.S. Army. On May 15, 1917 he was promoted to Captain. Taking command of the new U.S. Army Armor school and recognized for his ability to train and innovate, he was promoted to Major on January 26, 1918. Upon assuming the command of the 1st US Army tank battalion, he was promoted to Lieutenant Colonel on April 3, 1918. And for his heroic actions in leading the 1st US Tank Brigade in Meuse Argonne, he was promoted to Colonel on October 17, 1918 (though by 1920 he was demoted back to major in the peacetime Army—but he was put in a position based on his talents to help the Allies win the War). The military system is unique where we thrive in ridiculous out of date concepts like “up or out” (first employed by the Navy in 1917) or “Never make your leaders look bad” (based on the fact that through most wars, superiors were not prepared competently for the challenges of combat). While in the true test of a military professional, Gant succeeded in his mission and in doing so, he made some military leaders look bad because they were more focused on routine, process and remaining in FOBs (Forwarding Operating Bases) than doing what it took to win. Jim even received an email from his commander prescribing the length of facial hair of Special Forces soldiers while he was in the middle of making his plan work in combat! Only one leader in theater stood out in taking care of Jim Gant, and then COL Donald Bolduc (fortunately today, as a Brigadier General, Bolduc continued to push for and evolve the Afghanistan Local Police (ALP) program that originated from “One Tribe at Time”. It is a successful program as this review is being written). Jim Gant was all about the traditional Special Force mode of operation involving engagement activities through “Train, Mentor, and Advise” which worked and shunned away from direct action missions (which has actually cost more lives than saved) at all costs. This approach countered military leaders’ operational tempos focused on short-term data accomplishment and clear cut order. Therefore, the establishment had to find a way to get rid of Jim Gant before he was too successful, and it rocked everyone’s comfortable boat. The underlying message of the book is also about the culture of the Army particularly how powerful the personnel system has become, while creating an unadaptive and self-serving culture. The personnel system sees war as an aberration to the prescribed timeline and management system it has grown very comfortable with, so much so, that it will not even adapt by selecting, promoting and putting in place those individuals that have proven to excel at the very thing the profession claims to prepare for in order to win those wars. Even through history proves it has worked in the past. Make no mistake, Gant is by no means perfect but he made the best out of a really horrific situation and this book exposes several sides of the spectrum—good and bad. If the US Military, particularly the Army and Marine Corps truly want to evolve into the next higher level of professionalism by adapting Mission Command, then the first thing that must be accepted is that good ideas can come from any level, at any time, as long as they help solve the complex problems that they will face in the future. This requires an adaptive personnel system that even DoD reports say is an obstacle toward an adaptive force. And the future is now. It is sad, but the only the true compliments of one’s success in war come from those who receive the results, their enemies. In this way, it says a lot that al Qaeda leaders recognized the impact Jim’s plan was having on them, by putting a price on his head.